Frequently asked questions about Solar Power? I live in Central Scotland, do we get enough sunshine for solar power? Yes. Scotland gets around 50% of the solar energy you would get in the equator. Solar panels are popular in countries like Sweden, Germany and Denmark which have similar climates to ours. Also, modern solar panels work well with the diffused light you get on cloudy days. Will a solar panel work in winter? Yes. As it operates on light it will still work in the winter, however as the day is shorter and generally not as bright it will not be as effective as in the summer but will still produce electricity during daylight hours. You can expect your solar panels to last a long, long time. Many PV panels installed in the 1960’s still work perfectly and modern PV panels will have a much longer life expectancy than that. Yes. MORI carried out a survey recently which concluded that people would be willing to pay an additional £10,000 for a home with solar panels installed. I have a flat roof, can I still have solar panels installed? Yes. We set them on an A-frame tilted to between 20 and 50 degrees from horizontal. Are there different types of solar panels available. Yes. We only use the very latest industry proven solar panels from Sharp, Suntech, JA Solar and Canadian Solar. All panels are the very latest models which offer cutting edge performance and value. We can discuss with you the best panel for your exact needs but you can be sure that the panel we advise you to specify will be the very best available for your individual situation. Can I get a grant to get solar panels installed? No. Grants were available up until 2010. These have now been replaced by the feed in tariff. Do solar panels need regular servicing. No. They are usually cleaned by the rain. However, as with any powered device it’s always a good idea to have them checked over every few years to make sure everything is okay and no accidental damage has occurred. How long do solar panels take to fit? We can carry out the work in one day. Do you charge to carry out a suitability study on my home? No. We’ll be delighted to come to your home, take measurements and give you a report on what return you can expect from solar power. 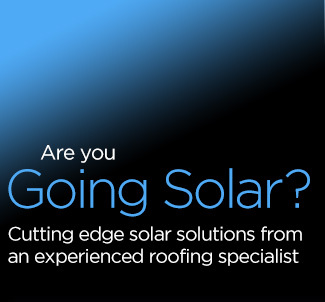 I’ve heard some nightmare stories about solar panel installations causing severe roofing problems, is there any risk? We’ve heard them too! A lot of companies, such as double glazing companies or joinery companies jumped on the solar panel bandwagon and caused a lot of problems. Working on roofs is very different to working installing windows as many of them found out. If you don’t know what you are doing it’s very easy to make a mistake and the next thing you know the roof is leaking and there’s water damage everywhere. We are a roofing company with over 30 years of experience in domestic, commercial and industrial roofs over every type imaginable. We are fully trained in all aspects of solar panel installation and have carried out many installations of substantial size and we have never had a single problem. We are often called in to repair installations bodged by other less experienced companies though, and know the kind of damage that can be caused by inexperienced tradesmen. You are based in Central Scotland, what areas do you cover? We regularly travel all over Scotland and the North of England, give us a call we’ll be delighted to come to you.